... my self made Gertie's Pencil Skirt? At the beginning of the summer I planned to sew a lot of clothes for myself, especially clothes of Gertie's Book, but in the end I only had time to make the Peter Pan Blouse. However, at least once a day I think about the book and the great clothes in it, and with some days off from work I finally had the time to make the Pencil Skirt! 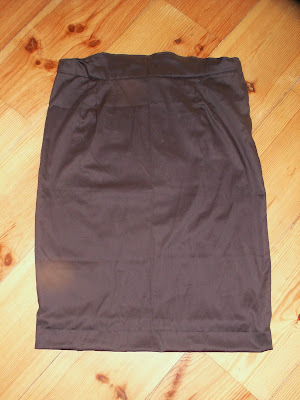 So I bought antracite elastic silk, yarn, a button and a zipper and made the skirt. I'm not entirely content with the result, because apparently I've lost some weight again, so although I already made it two sizes smaller (with Gertie's Peter Pan Blouse I overestimated my size also and made it two sizes too big), it's still a bit wide at the waist. Apparently the eating more fruit and vegetables, less potatoes and bread, but an even amount of chocolate of the last two months has lead to weight loss. Size 6/size 38, good for me! A couple of months ago I made a Lavender Sugar Scrub (find recipe here), just to try it because it looked so good, but the scrub was so great, that I used it every day. Especially the cocos oil in it does a lot of good things for my skin. 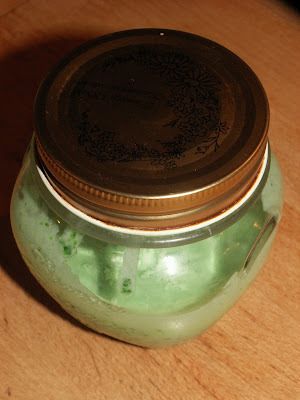 So now the jar is empty and today I made me a new scrub. This time I used Lemongrass instead of Lavender and I changed the red foodcoloring for a mix of green and yellow. I love Lemongrass and I guess that's why I also love Thai food, because the Thai use a lot of the grass in their dishes. I also love veggies, so today I share one of my favorite Thai vegetable dishes with you. As I told you a couple of weeks ago a friend of mine asked me to make her some Barefoot Sandals for her baby girl. 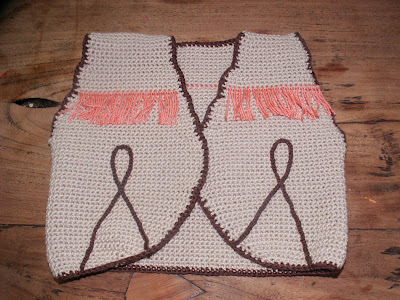 After that she wanted Cowgirl Booties for her, too, and when I finished the booties she also asked me to crochet a Cowgirl Gilet to go with the boots. A pattern for such a thing was hard to find, so in the end I made up something myself. My Cowgirl Boots were also featured this week by Busy Fingers, Busy Life, by The Cottage Market, by USS Crafty and by Crafts a la Mode! Thanks, Barbara and Andrea and T'onna and Linda & Carol!! When my husband and I went to Bruges some weeks ago, we ate breakfast at Le Pain Quotidien every day. They had the most delicious rolls, smoothies, sandwiches, coffee and more, all organic. What about Smoked Salmon on a Macadamia Nut Bread Roll or a Sandwich with Grilled Zuchini and Egg Plant on Humus Spread, among many great others? Or the best: Rhubarb and Strawberry Crumble? I love the hearty bites, but my husband goes for sweets and grabbed for the Hazelnut Spread everyday. Organic Hazelnut Spread. And from the moment I read 'Organic Hazelnut Spread' on that jar I got the idea to make Hazelnut Spread myself, organic or not. 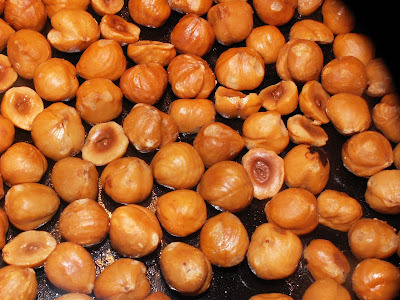 So I searched for a recipe and went to the market today to get the hazelnuts. Since some people read on my blog that a friend has asked me to make something for her she saw at my house, I already got two requests to make something for them, too! Great honor when people like the things you make so much that they want them for themselves, don't you think? 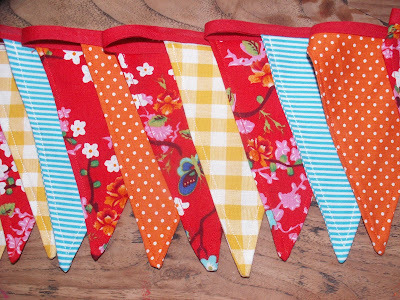 One of the things someone asked me to make is this bunting. Not something she saw on this blog, because I made this a couple of years ago and my blog is only one and a half year old, but something that hung from the trees at my daughter's birthday party this summer. She told me the colors and fabric patterns she wanted, I made a sample and after her approval I sewed the bunting. Barbara from Busy Life, Busy Fingers featured me again! And there's another one who featured me again: Andrea from The Cottage Market! She featured my Velours Dress with Crochet Roset. Wow, Pink Gingham Capri Pants!! A couple of weeks ago a friend of mine asked me to make her little daughter a pair of Cowgirl Boots. 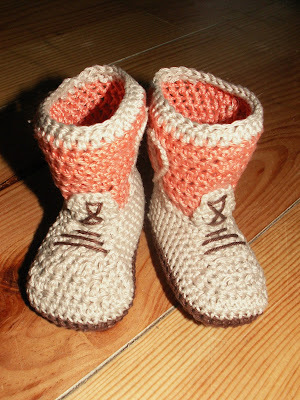 I've made them before and really, really loved the pattern, but most of my friends who got babies in the meantime, aren't really into cowboy-ish stuff, so it was just a one time project. Until now. The colors were chosen by my friend, but I think this color combi works out pretty nice! The Cottage Market featured me again! My Baby Girl Barefoot Sandals this time! 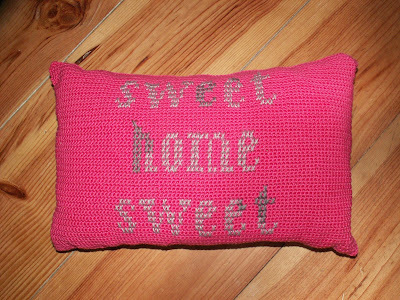 Some years ago I saw this great pillow cover at The Purl Bee (with tutorial) and ever since I wanted it to make that cover. Finally I did it and now that it's finished I like it even more than before. The pink background, the light and dark gray, I love the combination! What do you think? Wow, I got two features on the same blog this week!! Never happened before! Barbara from Busy Fingers, Busy Life featured both my Black Doily and my Fake Ice Cream Cones! Now that school has begun again, both my daughters want new clothes and beside the stuff I bought in the stores, I always like to make some things for them myself. Yesterday I had a day off from work, while my kids still had to go to school and kindergarten, so I had a whole day for myself (!). Great day to bring my sewing machine downstairs and sew some things. First I made was this simple velours dress with a crocheted roset. 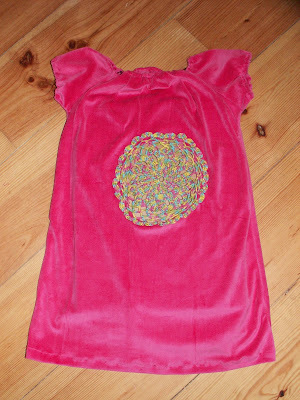 My daughter calls it her Belly Dress (because you can see her belly button trough the roset). My Butterflies are featured by The Cottage Market this week!